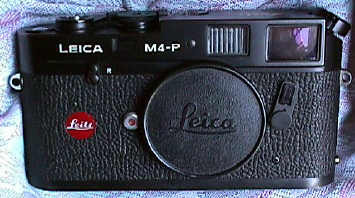 Leica M4-P 1984 "Press '84"
Leica loaned out cameras and lenses engraved "Press '84" for the 1984 Summer and Winter Olympics, and the 1984 National Republican and Democratic US Presidential Nominating Conventions, to qualified Press photogs. Note this is a dual sync, non M6 windows M4-P.
"I was working for TIME when I picked up both my Press '84 lenses. My guess as to why no one wrote about it, is Leica didn't make a big deal about it at the time. I didn't notice the marking on the 280mm until I got home and I lived with the lens all week." "I do not think there were 200 M4-P's. Most likely, there were a total of 200 pieces. I had made arrangements with Walter Heun, now retired from Leica USA to purchase a 280mm F/2.8 APO-Telyt-R after the events. Actually, I picked up the lens at the Republican Nation Convention (the last event) and I grabbed a 90mm Summicron-M. 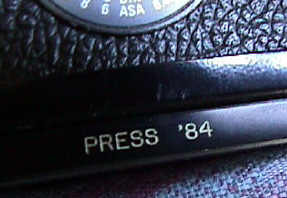 It was brand new and engraved Press '84. After all the stuff was over, I recall most the stuff was sold off to employees or "friends of the company." They had the whole product line available at the various events. But, remember a M-camera isn't the best camera to shoot sports with from a long distance. At these events, Leica is mainly interested in keeping its loyal users happy. They do not operate in the grand fashion as Nikon and Canon. Other than bodies, the only thing I sure there were multiples of was the 280mm APO, Only three, I have one, and no idea were the other two are. Marked Press '84, I have seen an M4-P, MR-4 meter, 35mm Summicron-M, 35mm Curtagon-R, 135mm Elmarit-M, and a 180mm Elmarit-R (2nd version). I have heard about R4's and R4-SP's." 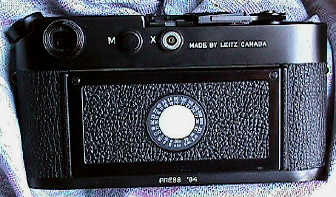 Recently I also received reports of two other Press '84's, a 90/2 in M mount, and a R4S. This brings up the reported "Press '84" variations as the Leica M4-P, MR-4 meter, 35/2 Summicron M, 90/2 Summicron M, 135/2.8 Elmarit M, R4s, R4-sP, 35 Curtagon-R, 180/2.8 Elmarit R, 280/2.8 APO. There are probably other lenses as well. Whatever the total numbers of the Leica "Press '84" lenses and bodies, they are very limited, and make for an almost unknown Leica collectible. My Thanks to Sal DiMarco Jr. for sharing this information.